We love Christmas as much as the kids do, and we wanted to offer you our lovely kid's holiday Christmas plates for your children to use. 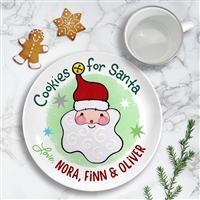 Our personalized cookies for Santa plates are unique and cute - your children will love to use them to leave cookies and milk for Santa on Christmas Eve. 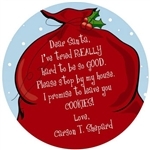 These personalized cookie plates for Santa come in a variety of colors and designs, including plates that feature Reindeer, Gingerbread Man, and Snowman. 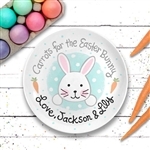 You can add your child’s name to the plate as well. These plates are lead-free and food safe, made in the USA by talented artists and come in 2 sizes (8 inches and 10.25 inches). 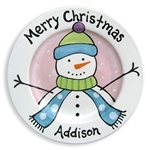 Teach your children to be thankful and appreciate their good behavior with these adorable personalized Christmas plates. At Tiny Keepsakes, we specialize in high quality products that can be customized, such as personalized cookies for Santa plates, lunch boxes, wooden step stools and growth charts. In addition to our kid's holiday Christmas plates, we also have other special Christmas ornaments that would make a perfect addition to your tree. All of our products are handmade and hand painted by talented craftsman. Be sure to call us 888.320.3080 or email us at customerservice@tinykeepsakes.com in case you have any questions. We offer 5% off discount with promo code ‘STEP’ to all our new customers. For our returning customers, we have a customer loyalty program to save money on their future purposes.